Today author Annalisa Crawford has an exciting true ghost story to share with us! 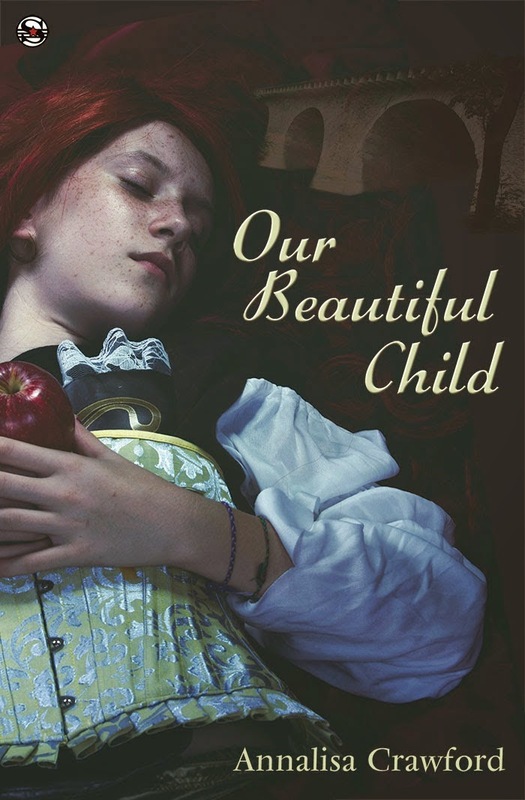 You might remember that I reviewed (and adored) Annalisa's short story collection That Sadie Thing last June for Reading / Watching / Listening To.... Now she has just released a new book, Our Beautiful Child, and it promises to be just as brilliant. I have a habit of putting myself into my work – a characteristic, a thought I once had, a conversation been involved in. In the title story of my collection, Our Beautiful Child, I put in a conversation I would like to have, based on real events. I would love to hear if you have an alternative explanation! According to my mother, I used to turn on all the lights, and move our large leather settee and the TV around the living room. I’m not so sure it was me. Okay, I realise my evidence isn’t extensive. But I have circumstantial evidence too! My grandmother ‘never felt settled’ in the house – her own words! So it’s over to you, did I play with ghosts when I was a child, or was I actually just very strong and stretchy? I’d love to hear your ghost stories too – I’ve exhausted the internet, and need new ones! MERCI Vanessa ! Tu sais je crois aux fantômes alors ta publication me touche beaucoup !!! Hi Vanessa! Great to read this spooky tale Annalisa. I'm inclined to believe you were playing with ghosts. Logistically it seems unlikely you could have moved furniture so young. Unless you had someone else coming into the house to do it for some odd reason. I have seen several ghosts throughout my life, mostly during my childhood, one in my early twenties, more n my mid twenties, and a few during the past ten years. The first ones I recall seeing was my grandad walking Bob, our dog, across the road from my nan's house. He waved and grinned, Bob barked, tail wagging. It was a midsummer sunny day and I was around nine years old. I called my mum and nan out of the house to see them too, terribly excited because granddad was recently dead and our dog Bob had been missing for around eight months. Mum shouted at me for being insensitive to my grieving nan. I couldn't understand how they couldn't see them, and why they weren't as happy I was. Until I looked back and found that my ghosts were gone. How lovely that you saw them both again, Shah. Sometimes kids can see a lot more than adults. I love hearing/reading stories like that. Makes the imagination run wild. I love a good ghost story too! I don't believe I ever moved any heavy objects while sleepwalking. I vote for ghosts. "Strong and Stretchy" - The image makes me smile. I think it could've been ghosts. EEEK! Ghosts scare the crap outta me! I got nothing to add! BOL! I'm fascinated by angels too, thanks for the link, I'll head over now. I like a nice ghost story. I am not sure about how I would feel sensing them in person though. Spooky. I don' think I would've lived there for long. Interesting post. I haven't detected any ghostly activity around me. We were there for 9 years in total. I think Mum convinced herself it was me, so it didn't bother her too much. You were tiny? There we go. It was you all along. I've always been tiny. It's us little ones that are bursting with incomprehensible wit, strength and creativity. No need for ghostly assistance when you're small but mighty. Smiles. Thanks, Vanessa and Annalisa. Have a great weekend. Telekinesis, perhaps? I like the "small but mighty" explanation, too. No ghosts where I grew up. We had demons. Telekinesis is an interesting theory - I'd never considered that. Demons sound worrying! I believe and I love your story! And, the book sounds amazing! I know the scariest thing that ever happened to me, was an out of body experience. I was 13, sleeping in bed and my cat was with me. I started to float up. I was looking down at my body. My cat started hissing at me. I said, Ginger it's me. I got scared and went right back into my body. I've also had ghosts visit me in my old house. One part of our house was from the 1800's and my bedroom was in the old part. Oooh, that's a chilling story. I bet sleepovers were fun in your 1800s bedroom! !